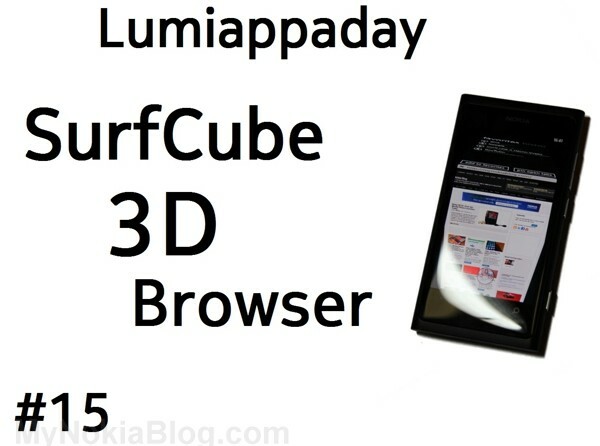 The most popular, fun and feature-rich web browser for Windows Phone! As browsers come and go, they’re your usual affair. Browser and a toolbar somewhere, maybe some tabs. 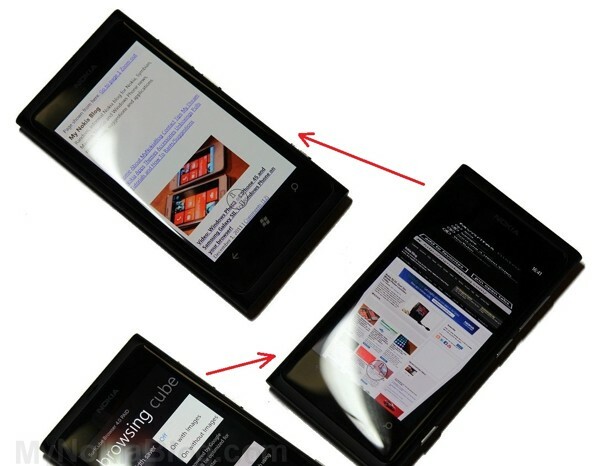 If you like Swipe on the Nokia N9 you’re gonna love this gesture based browser. For the most of it, you’ve got this unobstructed view of a full screen browser. Where’s all the settings and options? They’re hidden away with a swipe. As you do this, you see a your page rotate in 3D space, as if you were just tilting a cube. This thing has a lot of features and for the most of it, you’ll find them easy and enjoyable to use. By default now, I don’t think edge grab is activated, nor would joy stick. I would immediately turn those on in settings. Perhaps turn off the bottom menu thing to allow complete full screen. With the joystick (the clear circle with arrows at the bottom) you can flick within the joystick space or hold and drag as if it were a joystick. I use this to go back to main browser view when URL bar is showing. Edge grabbing/swiping from the left side (from main view) brings up your tabs. You can close tabs, create new tabs, close all or other tabs and of course, switch between tabs. It’s very useful. You can still see your page on the right whilst tabs is in view. I don’t know what the maximum number of tabs is. You can keep pressing new over and over and then scroll along the tabs when you have too many to view at once. get rid of the bottom menu – completely full screen. BTW, the bottom menu also has access to tabs, goto, orientation lock, settings, open web address, share etc. Turn cube back to front face when tab is selected. Very helpful here are mini tutorials which you interact with to proceed to the next gesture, making sure you know how to use it. allow bandwidth saver. This is incredible. It allows you to quickly turn any website, from the same browser, into a mobile version. You can choose with or without images – without saving extra bandwidth, but either being much faster. This is so useful. This doesn’t require the website to have a mobile version, it just views it as one (powered by google mobilizer). enable private mode browsing – browsing history is not recorded. Useful for friends who borrow your phone to check their facebook, if you have multiple login details for one site and whatever uses private browsing might have. Such as the suggested, “buying gifts for your spouse”. 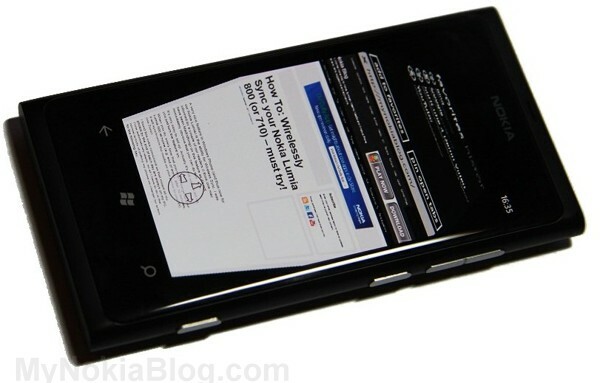 Force desktop mode – so if a site does have a mobile site and you want to view desktop, click this. There may be occasions where the mobile version is still brought, but I’ve not had an issue. Usability wise, it’s wonderful. 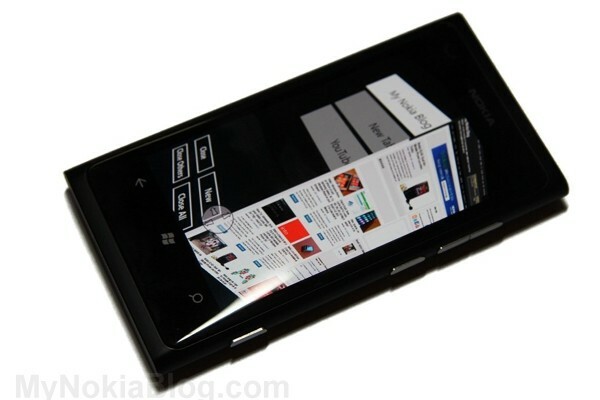 It is so feature packed and full of customization that you can tailor the browser to how you want it to look. Grabbing the URL bar seems very natural, and hiding it away is very welcome when viewing sites in complete full screen. Likewise for my tabs and settings. It is as standard, obscenely fast in the metro panning. The edge grab has been surprisingly accurate – though it might take a bit of getting used to, you’ll find (like with a lot of tap-to-gesture replacements) you can’t do without. It follows your finger very accurately. When you let go, it will flick to the side where it would most likely land if it were a real cube being tilted. The rendering engine is IE9. Say what you will about I.E. 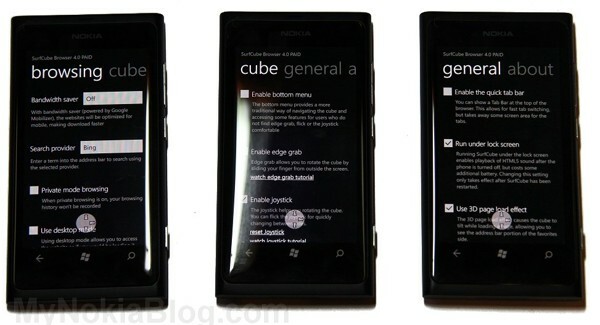 on the desktop, but it’s amazing on WP. Accurate rendering, very fast even on slow connections, fast scrolling and pinch-zooming. I think this browser also had some added features over I.E. such as much better youtube video playback (though i.e. is now very nice too with Mango). The only thing that doesn’t really work for me is flick gestures. That works best if you lock orientation. And from that, yes it works well too in landscape as well as portrait. It does multitask – so reading a particular tab at a particular point zoomed in on a page, check something else and then go back instantly to that point. This was annoying pre-mango having to reload this browser but post mango, even more awesome. The live tile shows tabs in view? It’s stable for the most part, but I have on one occasion with my Lumia so far encountered a crash (to which you can submit an error report). It takes about 4 seconds to start up. It is loading all that 3D cubeness though but if they could shave that load time I’d be pleased. This comes in two flavours. Free with a banner and paid for £1.49. That’s slightly cheaper than what I paid at the time (maybe 20p cheaper?). Either way, this is a bargain and I think the developer completely deserves it. There is a try before you buy feature on the paid one. Conclusion: This is a must have application. Probably one of the first things I will download straight away. It is remarkably feature packed, looks gorgeous, has impressive visuals that are actually practical and performs extremely well. 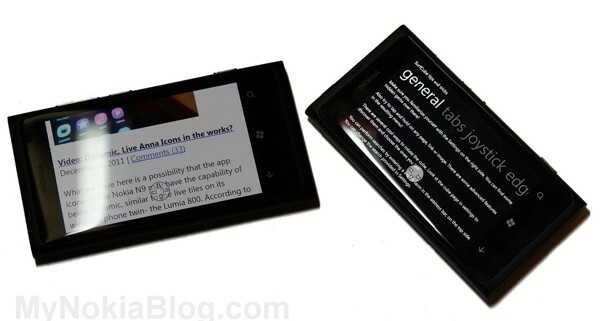 If you have a Nokia Lumia, you owe it to yourself to try this out.